Many Christians today struggle to answer these questions. Though you may know what you believe, the why and how behind the thought can be complex, confusing, and even mysterious. The time has come to walk confidently in your faith. Today’s Moment of Truth will be an invaluable tool as you grow in your understanding of and faith in Christ. Lee Patrick Strobel (born January 25, 1952) is an American Christian author, journalist, apologist and pastor. He has written several books, including four which received ECPA Christian Book Awards (1994, 1999, 2001, 2005) and a series which addresses challenges to a Biblically inerrant view of Christianity. Strobel also hosted a television program called Faith Under Fire on PAX TV, and runs a video apologetics website. 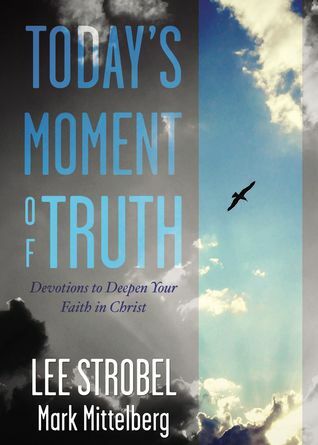 Strobel has been interviewed on numerous national television programs, including ABC's 20/20, Fox News, and CNN. Cassandra's Review- First you must undoubtedly have a strong faith and wanting to be a part of something more with God. Next you should have a few minutes cleared each day and the will to learn. Last you should read this book and spread the word, instead of just putting it back down. The authors created a great learning and growing experience for the readers, to connect with Christianity in an easy to understand way.